I started off with BMX bikes and tried to perform every jump or trick I could think of. At the ripe ol age of 10 I received my first Mountain Bike and never looked back. Growing up in Arizona I used to mountain bike in the desert surrounding our house with rocky hills, to river washes, and going up north to the high country on the weekends to ride in the forest. I loved the ability to ride where you wanted and be able to go off the beaten path at an early age. I would ride my mountain bike everywhere from school to racing my friends through canals or desert paths. 1996 I joined the Air Force and my first duty station was Nellis Air Force Base in Las Vegas. Not exactly what I was aiming for since I grew up in the desertI was hoping to move somewhere with trees and snow. Instead I moved 5 hours from my house to Las Vegas. While stationed at Nellis I met up with a group of guys that also enjoyed Mountain Biking. 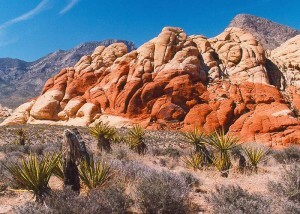 On the weekends we would drive out to Red Rock Canyon where we would ride until we couldn't go anymore. We would ride upwards of 30 to 50 miles depending how lost we became (This was before GPS's). I then moved from Las Vegas to Amsterdam, The Netherlands. The most bicycle friendly country in the world but more for city bikes. When you stand on top of your car anywhere in The Netherlands in any direction there was not a hill or mountain in sight. This was the longest period of my life without a Mountain Bike. I gained a ton of weight and my lifestyle was just plain horrible. The weather was horrible and my motivation was very low. So I was well over 200 Pounds (90 Kilos). Towards the end of my stay in the Netherlands I finally saw the light at the end of the tunnel that I was leaving. So I started running again, going to the gym, and looking forward to my next destination SWITZERLAND. 2010 my wife and I finally decided to move to Switzerland. One of my first purchases was a Mountain Bike a Rock Machine. My wife and I both bought a bike. My wife bought an all rounder as she just enjoys gentle trail rides. I went for the Full Suspension high performance bike. 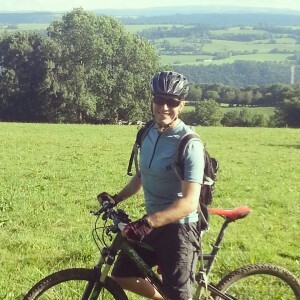 Having ridden motorcycles also my entire life this was my first mountain bike with disc brakes. After using them for about 2 minutes I fell in love with them. The feel is so much better than pulley brakes and the stopping power is amazing. Just like on a motorcycle you can jam on the brakes and control every bit of the power. My next question is when are floating discs, seamless transmission, and ABS coming to Mountain Bikes? I am just saying since mountain bikes are slowly evolving into motorcycle components I see this as the next step. After riding from the first moment I bought the bike until the snow started falling that season I continued riding as much as possible. Before I knew it people were starting to comment on my weight loss. Everyone was asking if I was on a diet. Well sort of as my wife and I decided to cut all processed foods from our diet and only eat fresh food. This along with riding my mountain bike as much as possible I dropped 30 pounds (14 KG) since moving to Switzerland and not to toot my own horn my body looks just as good. My legs look like rocks and my stomach is almost completely flat. With mountain bike trails right out my back door and amazing trails everywhere I ride. Why would I go to the gym while the weather is good? I will bring everyone along as I explore the different trails in Switzerland and discover more and more beautiful parts of Switzerland all the while staying in shape. My next projects include finding more trails, preparing for another race, and buying a new mountain bike for the 2014 season.